As we look forward to the Kickoff of the 2018 season, let’s spend one last 2017 post on a summary of the 2017 off-season activities. 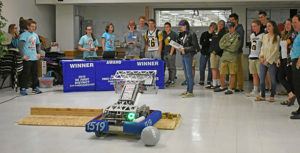 In addition to the Mayhem in Merrimack off-season competition, our team kept up the momentum through more off-season competitions (River Rage and Battle of the Bay), training meetings, mentorship of younger students, and robot demonstrations. Beginning in May, not long after our return from the World Championship, students well-versed in CAD trained rookies and other students using CAD classes followed by a design project to create robots to use for demonstrations in the future. In June, we enjoyed showing off our robot to people of all ages at the Rock’n Ribfest in Merrimack, and we also cleared tables in the food tents. 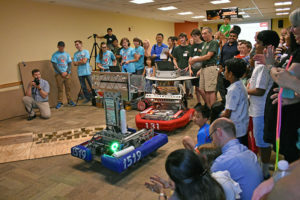 For the fourth consecutive year, we co-hosted a FIRST LEGO® League (FLL®) Summer Camp for a week in August. Robot demonstrations for our sponsors included Rockwell Automation’s Engineering Day, Burk Technology’s summer party, and Cirtronics’ Mfg Day. 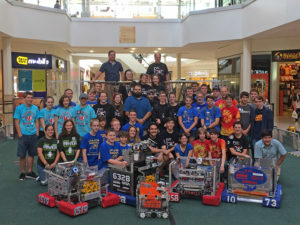 In September, we demonstrated our robot in collaboration with other FIRST teams at the RoboExpo in the Pheasant Lane Mall. 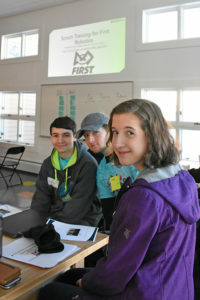 This past fall, we continued training at bi-weekly meetings, mentored two FLL teams, continued our technology project for the Nashua Police Department, and beta tested the 2018 control system for FIRST. In December, we collaborated with FRC Teams 1786, 1729, and 6731 at a workshop on Scrum to learn about this innovative management approach. Our 2017 off-season full of serving, training, and leading shows MAYHEM’s commitment to building people, not just robots!